On Wednesday, March 13, 2002, EDWARD WHITEHILL ROSENBAUM. Born June 4, 1928, son of the late Robert and Jeanette Whitehill Rosenbaum. He is survived by wife, Suzanne Rothschild Rosenbaum; two sons, Eric and Stuart (wife, Eve) Rosenbaum; two daughters, Hadley and Alexandra. Burial will take place at Arlington National Cemetery on May 20, 2002 at 9 a.m. Colonel (Ret.) Edward Rosenbaum retired in 1979 after 30 years of active and reserve duty in the Air Force. A business executive in Philadelphia, he was instrumental in founding the National Committee for Employer Support of the Guard and Reserve in 1972; he was Pennsylvania chairman of ESGR from 1986 to 1997. He also serves as chairman of the Pennsylvania National Guard Foundation, Inc., a charitable organization preserving the heritage of the Guard and providing scholarships and emergency assistance to its members. 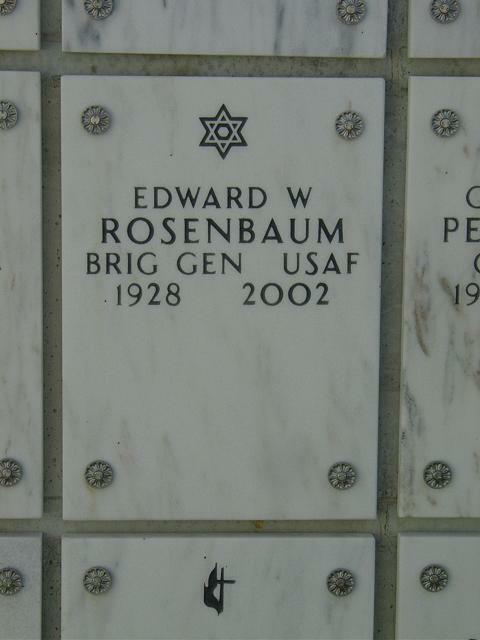 Edward W. Rosenbaum, Chairman of the Board and Chief Executive Officer for David Michael & Co. and a retired U.S. Air Force Brigadier General, passed away on March 13, 2002. Rosenbaum started his career with David Michael & Co. in 1949 and was the last of the second generation of David Michael owners. He was also an officer in daroma David Michael, S.A.S., David Michael de Mexico, S.A. de C.V. and chairman and director of David Michael (Beijing) Flavor Co. Ltd. Edward is the son of the late Robert Rosenbaum, one of the original owners of the company, and the father of Stuart Rosenbaum, David Michael’s Chief Information Officer and Vice President of Purchasing and MIS. Edward’s fifty-three years at David Michael & Co. were a tremendous contributing factor to the success of the company. Rosenbaum served with distinction in the Air Force for 31 years in active and ready reserve capacities. The recipient of over twenty decorations, Rosenbaum was pinned with the Stars of a Brigadier General USAF (ret.) in 2000. He was also Chairman of the Board of the Pennsylvania National Guard Foundation. Devoted husband, father and grandfather, Rosenbaum is survived by his wife Suzanne, children Eric and Stuart, daughter-in-law Eve and two granddaughters. Rosenbaum was born in Philadelphia, Pennsylvania on June 4, 1928. For more information, contact the Customer Satisfaction Department, David Michael & Co., 10801 Decatur Road, Philadelphia, PA 19154; phone 215-632-3100; fax 215-637-3920; e-mail dmflavor@dmflavors.com. Visit David Michael & Co. on-line at www.dmflavors.com. PHILADELPHIA, Pennsylvania - Edward W. Rosenbaum of Jenkintown, Pennsylvania, recently received the Stars of a Brigadier General, United States Air Force (ret) during a special "pinning on" ceremony held at the Community Club, Willow Grove Naval Air Station, Willow Grove, Pennsylvania. Rosenbaum has served with the Air Force for 31 years in active and ready reserve capacities. During the ceremony Major General Joseph Kovarick of Stroudsburg, Pennsylvania, pinned the Stars on Rosenbaum in formal recognition of his promotion to the rank of Brigadier General, which was previously confirmed by the U.S. Senate on June 30, 1999. Colonel Harold Yaskovich of Silver Springs, Maryland, officiated as Master of Ceremonies for the proceedings. Both Yaskovich and Kovarick have been friends of Rosenbaum for many years. Attending the ceremony were Major General Gerald T. Sajer, former Adjutant General of Pennsylvania; Brigadier General Richard Merion; Brigadier General Pat Macrone; and Brigadier General James M. Skiff, Deputy Adjutant General -- Air National Guard. Also on hand were over 100 well wishers and friends who expressed their delight that Rosenbaum had received the well-deserved promotion. Rosenbaum is Chairman of the Board of David Michael & Company, Inc., a Philadelphia-based international manufacturer of flavors, stabilizers, and natural colors for the food industry. For more information, contact the Customer Satisfaction Department, David Michael & Co., Inc., 10801 Decatur Road, Philadelphia, PA 19154; phone 215-632-3100; fax 215-637-3920; e-mail: dmflavor@dmflavors.com.